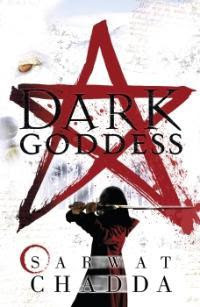 Sarwat Chadda's Blog: Dark Goddess, almost finished! This glorious cover comes courtesy of Puffin and as you can tell it will be very cool. We have Billi in her little red riding hood outfit about to get medieval on the rear of a werewolf. I'm on the last-ish rewrite of Dark Goddess, which is more of a straightening out of the furniture. It's all there, just needs a bit of tweaking so it's all in exactly the right place. The Puffin edition will be out next July, the Disney-Hyperion next October. I know its ages, but it'll be worth it, I promise! So, in the meanwhile, I would like to offer you a selection of werewolf distractions, just to get you in a howling frame of mind. I may have mentioned some of these before, but what the hell. Great is great. 1. Angela Carter- The Company of Wolves. This book is actually a collection of wolf-related fairy tales. All dark, gruesome and macabre. Also check out the film Company of Wolves which is utterly amazing. It came out way way back and is the best werewolf movie ever. 2. Dog Soldiers. Oh, this may actually be the best werewolf movie ever too. A group of British soldiers fight it out against a pack of huge werewolves in a farmhouse in the middle of nowhere. It's a horror/action/comedy and has one of the funniest Matrix jokes. See if you can spot it. Werewolf versus frying pan. Who will win? 3. The Book of Lost Things by John Connolly. Well the big bad is a wolf and his minions. It still counts for so many reasons. If you haven't read it yet, DO SO NOW! 4. Women who run with Wolves by Clarrissa Pinkola Estes. She deals with a lot of female fairytales and looks at the mythic and Jungian archetypes these tales represent. If you're wanting to write fantasy, supernatural or anything inbetween, read this book. Also, for the position on the male psyche, read Iron John by Robert Bly. 5. The Prince Ivan series by Peter Morwood. They have wolves in them but are primarily a retelling of some Russian myths, but in a joined up way. Actually, I think I read these back in the early 90's and they were probably the seed from which Dark Goddess grew. I've just found the first two on Amazon and really looking forward to re-reading them. It's got Baba Yaga in them (and her daghter, too strange to explain), so that's a reason enough, don't you think? Oh, an update on the next short story. Billi's Date is done but will be out in December. It's not that short so hopefully will make up for the delay. You'll meet the new squire, Mordred. He's pretty cool. I keep spreading book one out along the shelves. i go in the shop specially now. I love the new cover. i would still like to come down to town soon, i'll ring you when i'm not sulking. I've been following your blog since my first serious toe-dipping into the publishing business, which feels like ten years ago, but was actually January. You'll be beyond thrilled to hear that I've awarded you an award! (as you do). It's on my blog: sophiabennett.wordpress.com. Hope you like. I cannot tell you how much I am looking forward to this book!